This is a most enjoyable book, beginning with the arrival of a new doctor in Trinity. The main character, Martha Cade, is a midwife and has concerns as to what this will do to her profession. Midwifery has been handed down in her family for generations. Martha's faith is tested as she endures this threat to her job as well as other trials. She helps with a difficult delivery and tells the young doctor why she does not like his method. The Midwife's Tale is an interesting journey with roles reversing as the doctor becomes ill and has to be tended by Martha. They begin to understand each other and realize that there is room for both areas of practice in Trinity. Martha is encountering personal problems as her daughter, Victoria has left town with a traveling troupe, and Martha is concerned for her safety. She prays for a safe return of her daughter and that she will realize how much she is loved. Martha encounters many trials throughout this story, and it is hard to put down. I love the way all the trials are met with hope and faith. Even when her faith is tested, Martha relies on the Lord for strength and guidance. 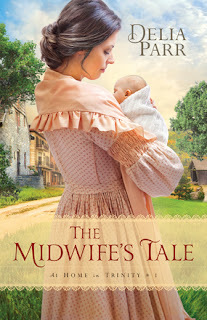 I would recommend The Midwife's Tale to all my friends and eagerly look forward to the next book in this series next winter. The publisher provided a review copy of A Midwife's Tale.